Experience the US Capitol Building and Capitol Hill like never before on a one-of-a-kind small-group walking tour. With your guide, checkout one of the most beautiful neighborhoods in Washington, DC, observe stunning architecture, and learn about American history. 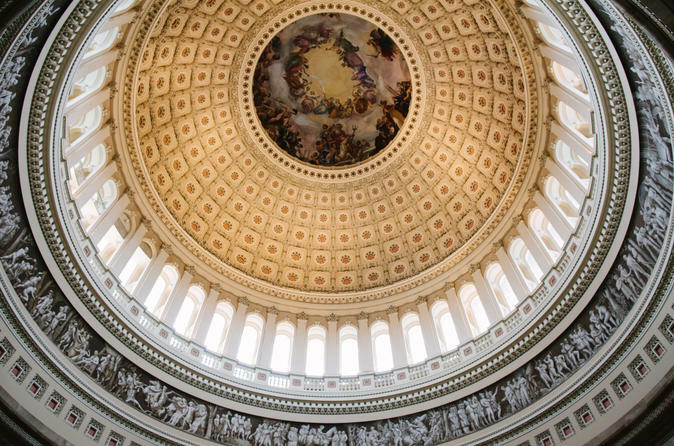 Benefit from reserved access to the US Capitol Building, enjoy a tour inside the Library of Congress, and be a part of the seat of power in the US. Capitol Hill is one of the most storied and beautiful neighborhoods in Washington, DC. Begin your tour at the most visited site in the whole city, Union Station. From there, you'll take in all the monuments and memorials around Capitol Hill. You'll ascend Capitol Hill, visit the Supreme Court, and then walk inside the stunning Library of Congress Jefferson Building, which boasts some of the most beautiful architecture in the city. Later, you'll stroll across the street and visit the United States Capitol Visitor Center. With your tour, you'll get reserved access to the Capitol Building as well as a docent-led tour of the Capitol. Reserved Access can help you save hours in waiting time and will get your right in to the Capitol Building immediately after your neighborhood tour ends.